This past weekend was the International Federation of Landscape Architects World Congress in Suzhou, China. My co-author Matthew Puntigam traveled there with professors and graduate students of the Tokyo University of Agriculture, and he presented our paper co-written with Professor Suzuki Makoto. The Kanda River connects many residential, commercial, and downtown neighborhoods before emptying into the Sumida River. We looked at the past, present and possible future of what is the longest river that originates within Tokyo. The biodiversity potential is significant: in one small section of Tokyo’s Kanda river, the Tokyo Metropolitan Government’s 2001 survey documented 260 plant species, 42 riverbed species, 9 types of fish, 291 types of insects, 30 bird species, 2 reptiles species, and 3 mammal species. 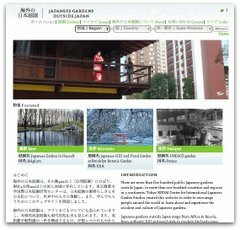 You can download a PDF of our paper, Biodiversity and New Urbanism in Tokyo: The Role of the Kanda River (6 MB). Your comments and questions are most welcome.